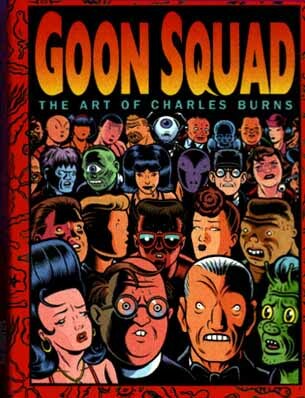 Charles Burns is an American comic book artist who came to prominence in the pages of "Raw". He is the creator of "Dog Boy" and "Big Baby". "Goon Squad" is a collection of cards, each showing a character from the mutant universe that Burns has created. It is a brilliant representation of the work of one one of the greatest artists in any genre. The entire collection is shown here. What is not shown is the "jigsaw" pictures on the reverse of the cards. The cards are not given titles in the box. The titles I have given them are for identification purposes only. This collection is presented by T H R O B, in the interests of improving the signal-to-noise ratio! Please e-mail declan stylofone if you have any comments. Currently under construction: my Howard Arkley page. Have a look at the pictures by this great Australian artist.